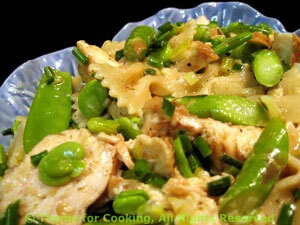 Warm Pasta Salad with Spring Vegetables, Weekly Menu Planner. I have always disagreed with most 'Pasta Primavera' recipes, as they are meant to celebrate spring but insist on using summer vegetables: tomatoes and peppers. This is my version, using only spring vegetables. If you can't get fava beans or edamame, just leave out.